When white grapes are put through the skin contact method, they often times come out orange(ish) in color, hence the term “orange” wine. Just last week, some friends and I had a Georgian wine dinner and, like my time in Georgia, I was drawn to the mystique of Georgian skin contact wine. We are all aware what the skins add to a red wine, whether we’ve spent the time to notice it or not (who here has had a non-red wine from a red varietal?). We are also aware what the absence of skins in white wine does, even if we’ve never thought about it from the perspective of what the wine is missing from an absence of skin contact, or what is allowed to shine because skins were left out of the process. When one experiences a skin contact wine, especially for the first or second or even third time, it will floor them. They may or may not like it, but I promise, they won’t have thought such a wine possible. I named this one of my most memorable wines of 2017 on my personal blog, Good Vitis. What a combination of combinations, right? The biggest draw of skin contact wine for me is that I know, whether it’s decent or exceptional, each skin contact wine is going to offer something unique. There’s no “classic” skin contact profile. It keeps you and your palate on your and its respective toes. 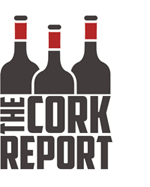 Skin contact wines have been creeping up in Maryland and Virginia. During a visit to Old Westminster last year, I tasted their first promising attempt at the style. At a recent visit to Veritas Vineyards and Winery, I got to taste a few experimental skin contact wines. 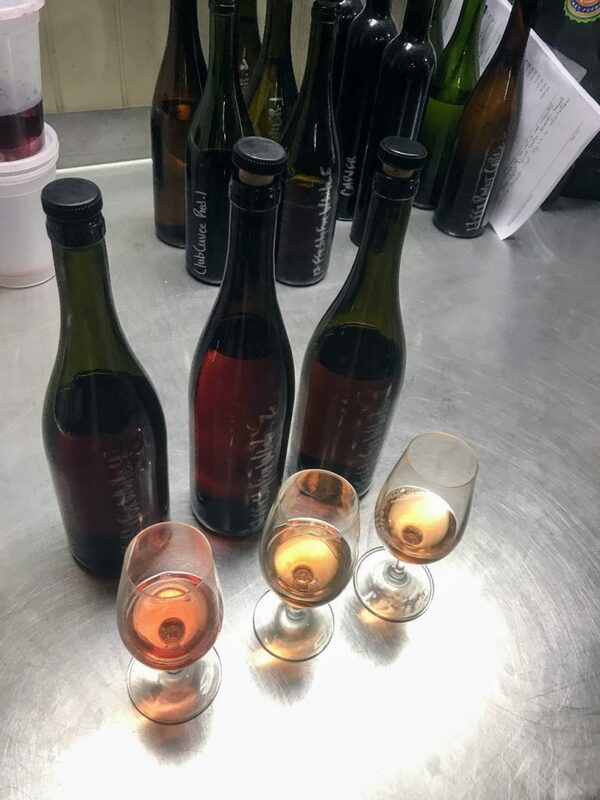 Emily Pelton, the winemaker, was a little unsure about her attempts, so I assured her of my penchant for skin contact wine and dove into the three samples that are, to use a non-industry term, in-design. Emily’s skin contact wine is made with the Pinot Gris grape, perhaps the quintessential variety for the skin contact method in America. Pinot Gris also happens to be among her least her favorite white grapes. I had to know, then, why work with the variety? “I was curious what the skin brings to the wine, and why we were treating it as a white grape when clearly it’s not,” she answered. An on-point observation for why Pinot Gris is a go-to for skin contact producers. Over time, Emily expects to adjust to riper harvest parameters to determine best practices for the method and better understand the effect that higher “physiological maturity” of the grape has on the wine, using a term that refers to a more holistic concept of ripeness that includes not just the standard acid and sugar measurements, but tannins and phenolic compounds ones as well. This will be particularly challenging given the extremely tight clusters that Pinot Gris grows in and the concomitant difficulty Virginia growers have in keeping it on the vine long enough in challenging years to reach higher ripeness that Emily hopes to eventually bring to the skin contact wine. Based on this first attempt, I’m not sold on the notion that more mature grapes will produce a better wine, but Emily is smart to continue experimentation. Riper grapes certainly would flesh out the palate more, and add some different flavors. I could sense Emily’s inclination to hedge towards an easier drinking style that may have broader appeal as she poured three different samples: a 100% Pinot Gris, one with 15% blended Viognier and a final with 30% blended Viognier. Each had real body, great acidity, texture and balance. Aromatics got more tropical as the percentage of Viognier increased, as did the broadness of the palate. There was also an inverse relationship between skin contact-style funkiness and the percentage of Viognier. I hope Emily goes Full Monty and brings the 100% Pinot Gris. It delivered the most unusual and intriguing combination of combinations, and I thought it was excellent. As you dilute the skin contact component, you dilute the skin influence, which my palate craves. The Pinot Gris was destemmed and split into two bins. Each was cold soaked for two days and then went straight into fermentation. A different yeast was used in each of the two bins, and fermentation was treated like a red wine, only they did not let the temperatures creep up. Punch downs were done twice daily, and the juice was pressed off as soon as fermentation completed. Emily will be selling a skin contact wine under her Flying Fox Vineyard label, which she uses as her “creative outlet.” Skin contact wines are not for everybody, but it’s my firm belief that everyone should at least try a few of them if for no other reason than to experience the impact skins have on varietals we’re accustomed to consuming made exclusively with the skinless contact method. The difference between skin and skinless contact Pinot Gris, for example, is night a day in every way. For a real good time, I suggest sitting down and trying some skin contact wines to see what you think. When Flying Fox’s comes out, get a bottle of it, and taste it along with Old Westminster’s Alius, Channing Daughters’ Ramato from Long Island and a bottle of the original from Georgia (the best I’ve found state-side is the Shalauri Cellars Mtsvane, and the older the better). I promise you a wine experience unlike anything you’ve had before.